This is Yaara 3 years ago, on the day she started the "real" kindergarten. She was with 25 more kids and it was a big difference from the place she was before - 10 kids. The journaling says: First day in a 'big kids" kindergarten. 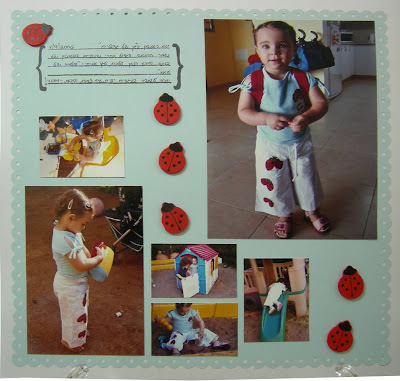 The summer vacation is over and after 2 years in Pnina's nursery school it's time to go to a real kindergarten: "Liat's world". Yaara is dressed with beautiful clothes, wearing braids in her hair (not sure how to translate it..) - ready! I used: Scrappy Cat Journaling Blocks clear stamp, Fiskars Threading Water border punch, StazOn.